The JRC, in collaboration with ACEA (Rome's electricity Distribution System Operator), assessed the merits of deploying smart grids all over the city of Rome (download full report here). For the first time, the JRC's Smart Grid Cost-Benefit Analysis (CBA) has been applied to a full-scale smart grid urban project, rather than (only) to a small-size pilot. The overall outlook for Rome's smart grid project turns out as positive from both the private investor’s and the societal perspective. This report shows how the JRC's smart grid CBA methodology can be used to assess the financial and economic viability of real Smart Grids projects and help the investment decisions of Distribution System Operators. The Smart Grid, the upcoming generation of intelligent electricity networks, is an undisputable building block for the development of a Smart City and promises to drastically change the way power is produced, exchanged and traded. How can smart grids help the EU Member States in achieving the ambitious energy targets for security of supply, sustainability and competitiveness? Consistent with its mission of providing science-based support to policy makers, the JRC has developed a series of tools and methodologies to observe, simulate and assess Smart Grid developments. The wider aim is to cover socio-economic impacts of Smart Grid projects, in order to quantify the real benefits possibly gained both by investors and by society at large. This report features a collaboration between the JRC and ACEA - one of Italy’s biggest Distribution System Operators (DSOs) - to study the gains of deploying Smart Grid technologies in big cities. After a preliminary analysis on the pilot project in the district of Malagrotta (Rome), the study extends its aim to the whole grid of Rome, which connects more than a million electricity users. The Cost-Benefit Analysis (CBA) is conducted from both the private investor’s and the societal perspective, followed by a comprehensive sensitivity analysis to test the robustness of the results to variations (especially adverse) in the influential parameters. 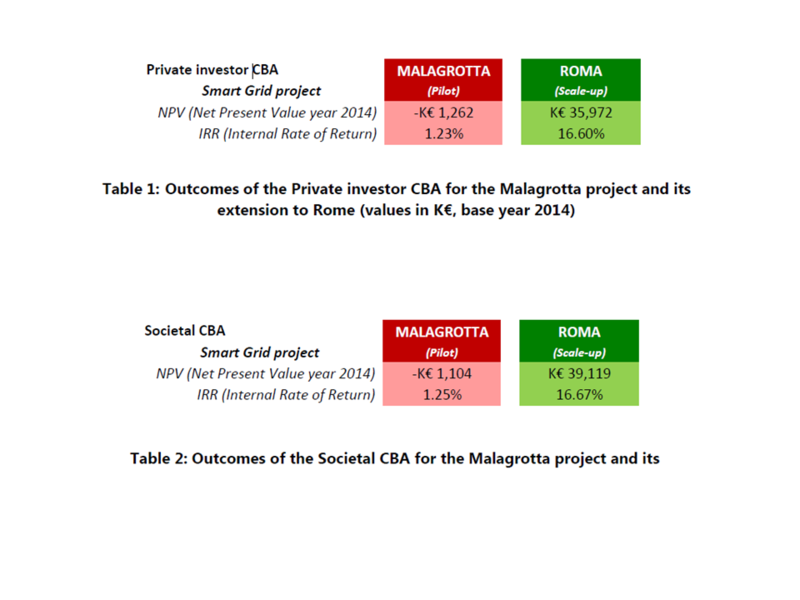 As you can read from the tables , the study gives overall positive outcomes for the extension of the smart grid project to the city of Rome, both in the private investor/financial CBA and the societal/economic CBA, whereas the smart grid pilot alone faces the typical challenges of a demonstrator leading to generating losses of moderate size. Clearly, as the Smart Grid experimentation on portions of the distribution grid of Rome continues (e.g. by testing the impact of selected storage and Electric Vehicle technologies) the proposed analysis shall be updated accordingly to identify additional beneficiaries and merits of the Smart Grid solutions deployment. The JRC will continue monitoring the progress of this and other projects by working with relevant Smart Grid stakeholders in order to shed light on whether and how Smart Grids present a viable business case for investors and society as a whole.